Don’t block stairwells. Keep them clear so others can use them easily and safely. Learn more about safety on GO. Getting you to your destination safely and on time is always our goal. When summertime temperatures soar delays can sometimes happen. How Does Extreme Summer Heat Affect GO? 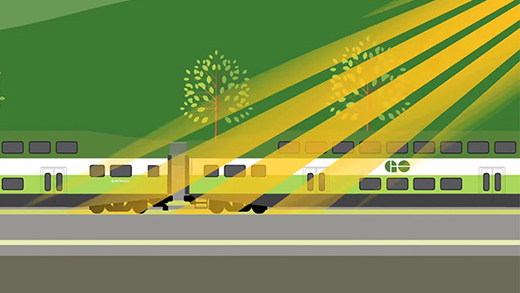 On hot days, our train engines and air conditioning systems have to work harder and can become strained so we inspect our vehicles more frequently. We also closely monitor our tracks during extremely hot weather as the sun can heat up the rails and make them expand. This can cause the rails to buckle or develop kinks, called “sun kinks,” and can occur when temperatures are above 30°C for two or more days. While trains can still travel on the tracks, for safety reasons, they need to run at a reduced speed and be carefully monitored. Sun kinks are repaired as soon as possible and usually overnight or early in the morning to not affect your commute. How Do I Stay in the Know During Extreme Weather? Signing up for On the GO alerts to get email or text message alerts sent to you. Visiting our Service Updates page to find out the status of your trip. Talking to our helpful staff who can provide you with the most up-to-date information. Checking the departure boards at Union and all other stations which display the latest trip information.